74 pages, 5.5" x 8.5"
For four years, James LaFond conducted a study of violence in his hometown of Baltimore, Maryland. 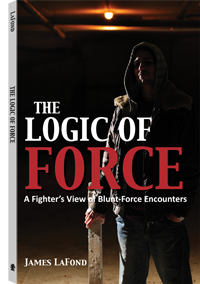 Following up on The Logic of Steel, his highly regarded look into the reality of edged-weapon attacks, LaFond now presents The Logic of Force, a study of assaults featuring blunt weapons and unarmed attacks. The Logic of Force tells stories of people who were caught in these blunt-force attacks—victims, attackers, eyewitnesses, and Good Samaritans who bravely stepped in to break up the fights. Chronicled in the vernacular of the street, these stories are gritty, entertaining, and—most important for those interested in self-defense—educational. Violent men are painfully predictable, if we bother to pay attention. This study underscores the importance of tactical awareness—and the high cost exacted for not staying alert. Just in case you do end up in a dangerous situation, these accounts show you what will and will not work in a short, feral, winner-take-all brawl, as well as the disturbing range of blunt-force objects that can be used as improvised weapons to hurt you. One of the most violent cities in the world, Baltimore can teach all of us valuable lessons about avoiding or surviving violence. The Logic of Force teaches you how to live peacefully among the predators on your street. James LaFond works as a night laborer in Baltimore, where he has been documenting the violent underside of the human population and the relationship of ordinary aggression to the hysteria of contemporary martial arts study since 1966. His wife, Cindy, pays the life insurance bill well in advance of the due date. Stickgrappler's Note: I am guessing the Paladin site will be shut down at the end of the 2017 year and I'm archiving select Paladin Press pages to my blog to preserve an essential part of martial arts from 1970-2017. Archiving some of my favorite Paladin titles.